Many companies develop an Environmental Management System (EMS) according to ISO 14001. To demonstrate adherence to these requirements, they get “certified” or “registered” by an accredited registrar. This is the best way to verify the company is meeting ISO 14001— through the use of an external EMS audit conducted by accredited external auditors. However, registration services/ audits cost a lot of money. For a small company, registration auditing services may cost $15,000-$25,000 over a three-year period, not to mention the drain on employee resources needed to answer the auditor’s questions (auditees). The less expensive solution would be for the company to “Self-Certify” or “Self-Declare” conformance to ISO 14001. The self-declaration simply implies that a company which has implemented ISO 14001 publicly asserts that it conforms to the standard (without the involvement of certification bodies/registrars). So the question then becomes, how does your company self-declare with credibility? Do you use external accredited RAB/QSA ISO 14001 auditors? Do you follow a protocol established for this purpose? REFERENCE – US Army Procedure for Self-Declaration on Compliance …. This is very similar to the auditing guidance offered by ISO 19001, a step-wise procedure for managing and conducting EMS audits. NC State IES can act as an external auditor to assist companies in self-declarations. 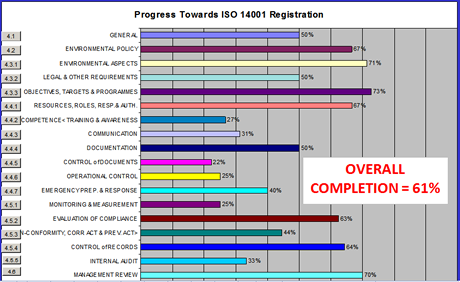 By auditing key personnel at all functional levels of the EMS, IES can provide the quantitative assessment to demonstrate conformance to ISO 14001. An example of a possible report format is shown below. This type of self declaration / external audit approach especially makes sense for companies that have little or no environmental issues (warehouse, office complex, etc).